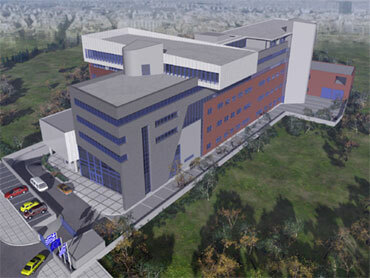 The five-story office building at Athenon Avenue, is intended for the services of the Criminal Research Department of the Hellenic Police and includes 16.000 m2 mainly offices, laboratories such as chemistry lab., exploration lab., DNA lab, photo lab, etc, multipurpose Hall, printing office, restaurant, kitchen, archives and storage area. It includes also 3 basements of parking areas with a total surface of 14000 m2 to cover 270 cars. The total area of the building is 30.000 m2. All the E/M installations are foreseen including special installations required for the operation of special rooms.